The Golden Lion on Oundle Road in Woodston although where on Oundle Road is unclear although I tend to agree with Phil Long’s observation below that it is today the salvation Army shop. The pub’s existance is confirmed in trade directory listings in 1898 with Henry Fuller as Landlord. It is also in the 1906 trade directory with George Everitt as Landlord & again in 1910 with the same landlord. 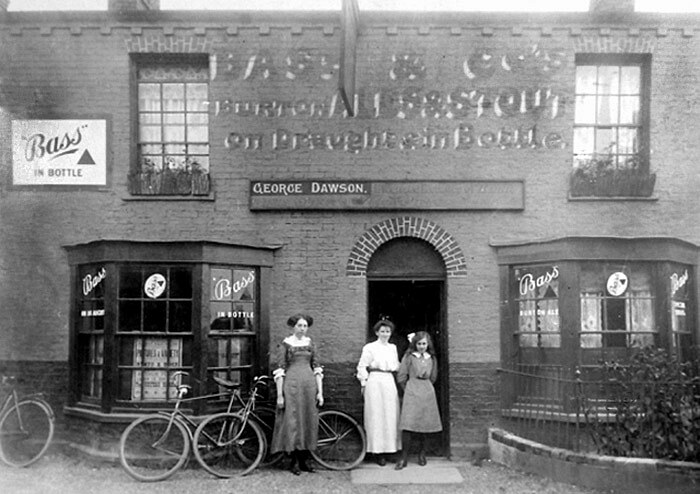 The Cherry Tree pub was functioning in 1910 so the likelihood is that the Golden Lion would have been located somewhere between Bread Street and the site of the old Oundle Road Co-op on the south side. Thanks to Roy Taylor for his input to this one. More info from Eddie Hann ……. “Just for info, this was at 46 Oundle Road. You’d probably recognise it as the Salvation Army Care and Share shop opposite what years ago used to be the old school (also a bridal shop.then golf equipment shop then UK First Aid). Don’t know when it opened or closed but can first find it in 1881 census when it is run by Charles Anker. By 1891 it is being run by a former railwayman, Henry Fuller, who in 1881 had been running the Eight Bells in Westwood Street (as that part of Westgate and Bourges Boulevard was then called). Henry may have been related to the Henry Fuller who was running the Cherry Tree in 1861, as when he worked for the railway he lived off Oundle Road in New Fletton. By 1901 Henry had died and his widow Anne was running the Golden Lion and by 1911 George Everitt was there. “I was looking through your site today after a friend recommended it, and I’m fairly certain that The Golden Lion pub pictured on the Oundle Road page was exactly where you thought it was. Having looked over the road from where I live, I’m almost certain that the former pub is now the Salvation Army shop. The architectural details where the roof meets the front wall are evident, as is the shallow pitched roof and the two chimneys (though one is shorter now). The windows differ, but the current ones are so obviously not from the same period as the building (they are more modern, wide windows, rather than the narrow sashes of the period). Similarly, the doorway has changed, probably at the same time as the windows were altered.